Remember that childhood feeling of anticipation, of adventure? Of a day of freedom waiting to be explored? Often those days seem faraway in adult life but last week I was lucky enough to experience a few hours of such bliss. As a strike by teachers closed half the schools around the country we decided to use this day for relaxation and fun. The sunlight glows in the bedroom, gentle golden hues blending with the soft lilac of the flowers on the curtains. Yes! Already a flutter in my tummy. A few minutes to just lie and savour the minutes unencumbered by alarm clocks, free from the usual morning rush. A bumble bee buzzes its way in through the open windows, ambling around the windowsill, I imagine it bumping along the ornaments. My normal irritated reaction is replaced by one of quiet musings, the soft hum calming my incessantly busy mind. As the room warms from the morning sun I rise, open the curtains and gently edge the bumble bee out. An hour later my husband, son, his two friends and I are heading towards the coast and the town of Clacton-on-Sea – an old seaside resort popular with London day-trippers in the late 1800s/early 1900s who arrived by steam boat. Today the pier on which the passengers disembarked is still standing and is one of the town’s main features. ‘Urgh,’ exclaims one of the friends. ‘The sea is a really weird colour.’ I look again as we drive along the sea front. Knowing not to expect the brilliant aquamarine of the Mediterranean I expected at least a dark green shade. Not the sludge brown water moving laboriously up and down in shallow waves, the sand that had been stirred upon during the stormy night gradually sinking to the bottom but as if exhausted barely shifts at all. We park up and the youngsters are off and away with just a hasty meet up time arranged. We head to the beach, the soft sand giving way beneath each step and with effort we walk on. Distance – I relish the long distance views, the beach stretching for miles ahead of us, the sky a wondrous mix of clouds, rain threatening then the sun peaking through the brightest of blue respite. Its glare a sign of hope, the possibility of summer warmth. By the end of the day, we swelter in the heat, the cute little palm trees along one beach section providing scant protection. I lie underneath the fronds of leaves, close my eyes and imagine myself far far away. Ahead we spy some buildings and coming closer the most delightful beach huts have me smiling. Pastel coloured, they look incongruous on their own on the sand but they are so sweet. Ready for the doors to be flung open and for children to exit in a gaggle of laughter and swimming aids. As it is the beach is quiet on this an otherwise normal working & school day. We march on for a few miles, then turn and head back. The serenity of the slow turning blades of the numerous windmills out to sea captivates me. The silent motion mesmerising. I stare on and only now realise that they are placed in long rows and that here, in one spot I see blades upon blades, overlapping as I’m standing directly in front of one row. Resembling a cactus. Like an open swiss army knife. What do you see? Ahead is the pier, the popular amusement arcade finally gearing itself up for the day’s activities. The view from the end of the pier back to town is fascinating – after all how often do you see the mainland apart from on boat trips? To the side I suddenly stop and gawp. The unexpected murals a joy to behold; cheeky, bold and full of mischief. I spot the website and later discover this is one of many professional pieces of art created by The Silent Hobo. I love the unexpected, to be surprised, so much the better if on my doorstep. By the pier the famous (really?!) Pirate Radio Station Museum is closed. My husband sighs but I emit a silent cheer. Then I begin to wonder, what would be on display inside. What kind of memorabilia would be on display to celebrate the 1960s, when ships would be anchored in international waters just off the coast, the illegal radio stations sending the popular hits out to the east coast – songs not sanctioned by the mainstream radio stations. Later many of the DJs would become household names working for the establishment of the BBC. The south end of the beach is marked by the Martello tower, built in the 19th Century by a country fearing the might of Napoleon and possible invasion. The small defensive fort towers are to this day scattered along this stretch of coast line, their rotund shape visible from miles away. The only sadness to tinge this day is the sight of an injured seagull on the beach. Whilst a flock loudly squawk and fly around, one seagull struggles its way along the beach, one of its wings dragging uselessly in the sand. Almost torn off, it is held on by a sliver. As one the whole flock lifts, frightened by the arrival of two football playing children. The seagulls swoop gracefully in the air, their white grey feathers shimmering in the sunlight. All but one. The damaged bird looks on, mournfully I feel. Alone and stranded. I couldn’t take a photo of it, it just felt wrong – but here is one of just some of its friends. Can you spot the sleepy one? Finally our legs moan in rebellion and our stomachs grumble with hunger; obediently we enter the pub we’d seen earlier. By now heaving with visitors we exit and search out a quieter location and happily come across an Asian restaurant. The vegetarian spring rolls are the best ever and quickly I devour the four. The pièce de résistance is the main course. Satiated we head back to the car, via the previously unseen beauty of the local gardens, packed with people enjoying a bench picnic. What do Ingrid Bergman and Camilla Läckberg have in common? Fjällbacka! 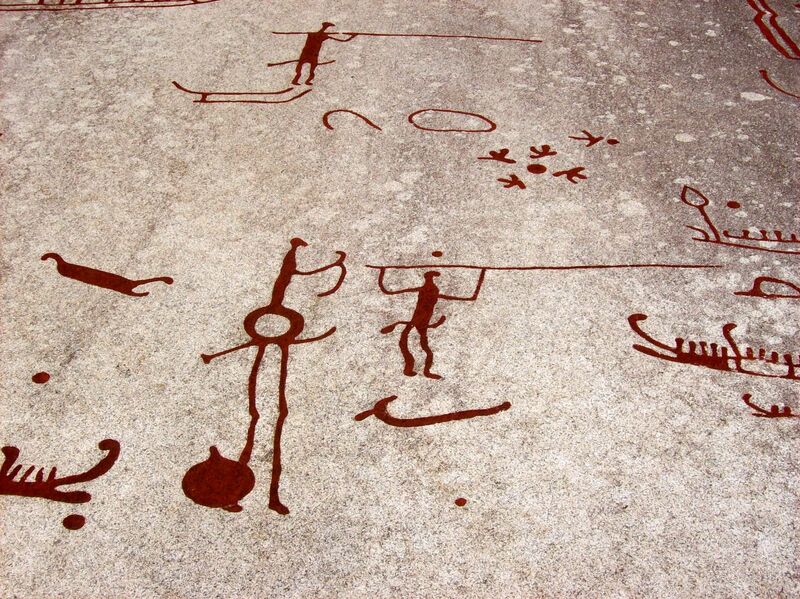 This is a beautiful town on the west coast of Sweden about two hours north from Gothenburg. Ingrid Bergman spent every summer here with her third husband and Camilla Läckberg was not only born in Fjällbacka but also set nine of her hugely successful novels in the town. 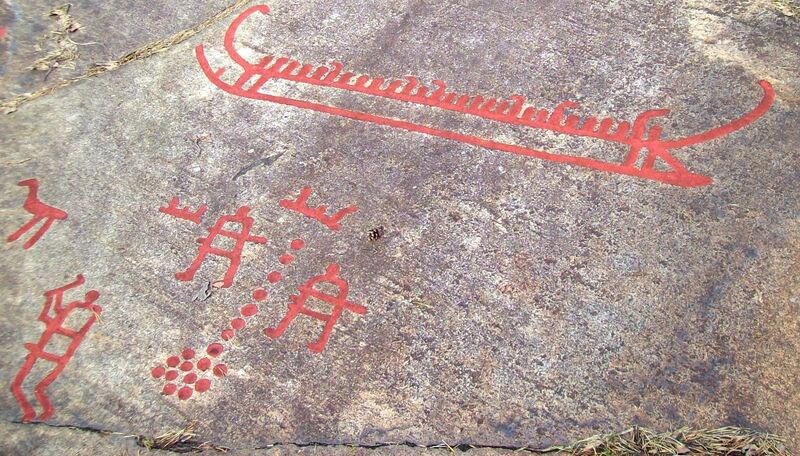 It is one of my favourite places to visit with spectacular views from the huge rocks of Vetteberget. Below it are nestled the houses, shops and restaurants. It has over 100 steps to the top and en route courage is required to traverse under Kungsklyftan – the three gigantic rocks trapped in the chasm above ones head. It was renamed the ‘King’s Cleft’ following a visit by King Oscar II in 1887. After the long walk a relax by the harbour front cafe is a must – even on a chilly sunny Spring day! Ah…perfect serenity. Forests! 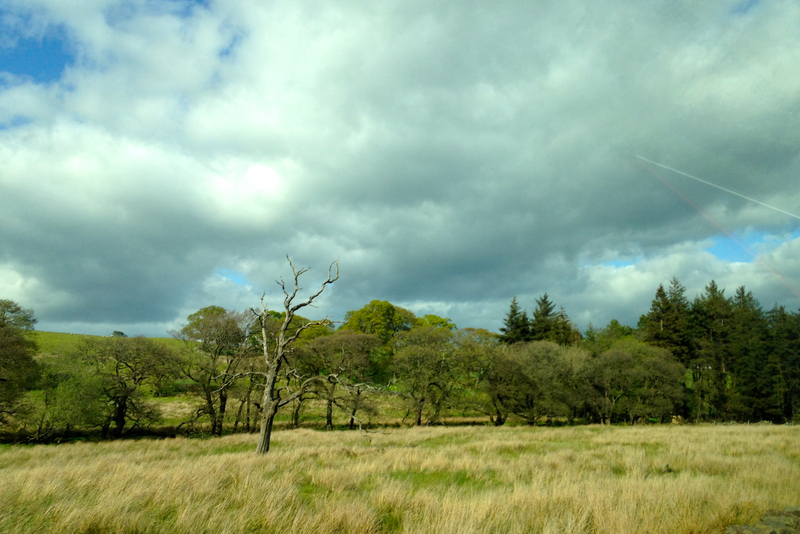 Years ago travelling by car across Sweden I felt the landscape was mainly the green corridors of forests. Only later did I discover I was not far off the mark with nearly 70% of the land being forested. Where we live is no exception; forest views all around as well as stunning walks amongst the trees; birches and firs growing side by side as well as the odd hunting tower! Believe it or not, this photo is the genuine article. Sunset on a glorious evening as seen in reality. No photoshopping required! Mystery is embedded in the very heart of all forests and this one is no different. During one walk we came across this unusual stone built rectangular wall. Low in height, with no obvious entry point. We are still musing over its possible usage / meaning. Any ideas would be very welcome. This is view of the nearest lake to where we stay whilst in Sweden and this particular lake is one of over 95,000 lakes across the whole of the country. 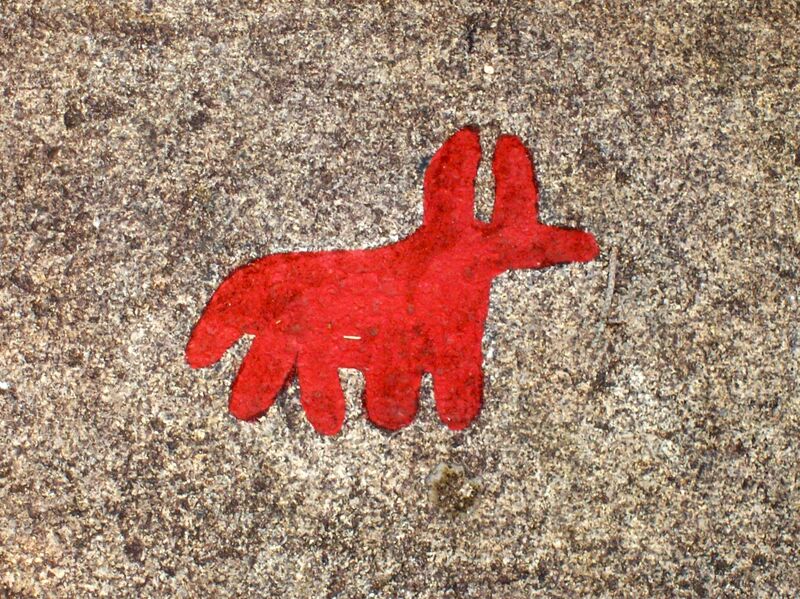 I hope you have enjoyed my snippets of information and photographs from my latest trip to Sweden this Easter – posted by popular demand!! Thank you for all your interest. PS. 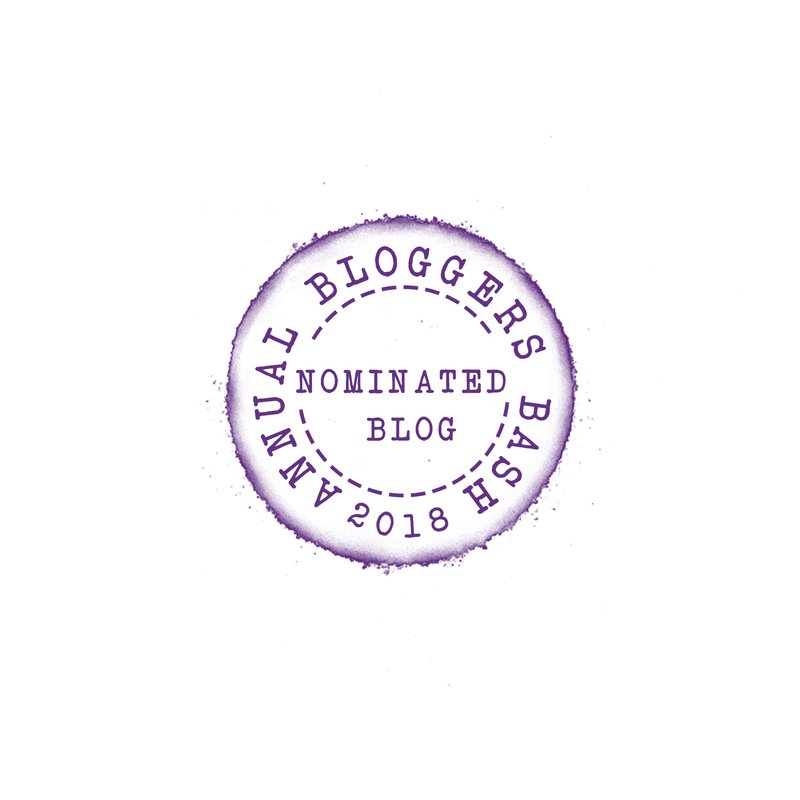 This is my 100th post – Yippee!! This wasn’t the first time we had to brake suddenly. Not the noisy tyre screeching stop; rather a quiet sedate halt before a hushed ‘ahh’ filled the car. We all leaned forward. I glanced back and forth, desperately seeking out the cause for this joyful expression. Them? I had been looking for perhaps one deer, camouflaged amongst the dark brown tree trunks, the green of the forest sucking the clarity of shapes into itself. Abruptly I sit back into my seat. A young elk calf had just skittered its way across the road directly in front of the car. By the tree line it turned around and looked back to the other side. Just then I saw ‘them’. Another calf, hidden deeper amongst the trees, then Mother Elk stepped forward towards the road. This was my ‘Northern Exposure’ moment! For years I’ve watched the starting credits of this show, always amazed as the elk nonchalantly wandered through the town. Here I saw the giant beast close up. Totally still as it weighed up the situation; its two off spring trapped on opposite sides of the road. We didn’t move. No one said a word. Feelings of awe and majesty flowing over us. Then with a few wide strides the elk passed in front of us – to the lone calf. I’ve never seen such a sad forlorn expression as that on the remaining calf. Its bewilderment and fear complete. We waited for the scenario to play out – it was obviously the language of stares. Which luckily went on for minutes so we could relax in the close proximity of these animals. As suddenly as Mother Elk had crossed the road, so it did again – back to the shyer, more fearful calf. Rejoined they looked back at the original calf. One minute. Two minute. The game of dare. One, two careful steps and then it walked, sauntered across. The Brave. The Fearless. The Adventurous. A hushed cheer in the car and the animals scarpered into the forest, the cowardly one turning away from the others before bolting back to them in a hurry. So many lovely bloggers have asked about my trip to Sweden and for some photos and so I am only too happy to oblige. I will return to the book reviews in my next post. However, I will be posting more photos about my Sweden trip during the next couple of months. The same contradiction of feelings rose in me as I studied the noticeboard outside the grotto at Painshill Park, Surrey. Here, outside the bright sunlight sparkled across the lake and immaculately white swans swam in a disjointed line. Inside beckoned darkness and the unknown. ‘We are going to the park for a picnic,’ my friends had said. In my mind I pictured swings and slides interspersed with the occasional thwack of a football. I never imagined this wondrous landscaped garden created over two hundred and fifty years previously. The perfect landscape of green grass, trees, vineyard and a lake with a variety of bridges. The park teemed with formidable follies such as a Turkish Tent perched on a hill, a Gothic Temple tucked away in the trees and nestling away by the water’s edge the frontage of an abbey ruin. For the creator of Painshill Park, Hon. Charles Hamilton (1704- 1786), the folly par excellence was this grotto, the largest and rarest of its kind in the country. 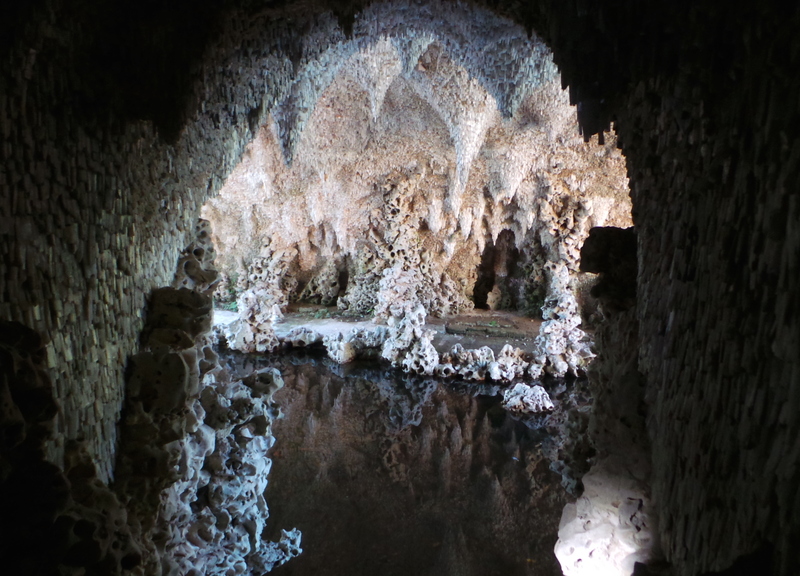 Hamilton owned Painshill and as a landscape gardener with experience to rival Capability Brown, he designed the garden, including the grotto, which alone cost over £ 8,000 (now £600,000). He then commissioned the premier grotto maker of the era, Joseph Lane to carry the project to completion. 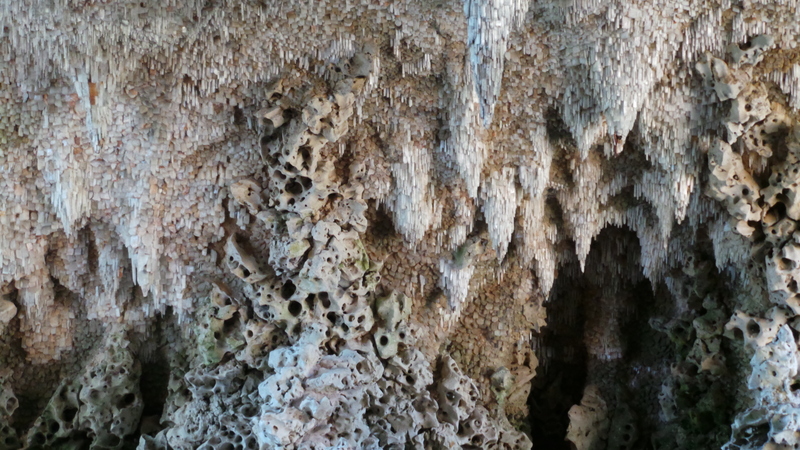 I had heard murmurings from my friends about the grotto as we walked. 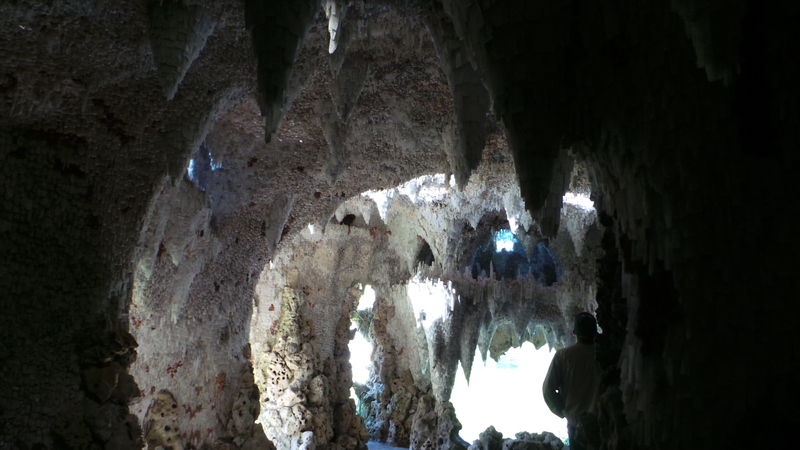 ‘Recently restored grotto.’ ‘Took over 15 years to repair.’ ‘The whole roof had caved in.’ I paid scant attention to their words, allowing the briefest image of dark dank caves dripping with water to flash before my eyes before quickly banishing the images. ‘Can we go in?’ exclaimed my son as he rushed back from his ventures around the park. ‘It’s just around the corner,’ he added, knowing us too well. Us lazy adults had enjoyed the unseasonal warmth and sunshine to rest on the blankets after a hearty lunch (thank you Waitrose!). Who was I to say no? I’m glad I didn’t! We ducked into the darkness and slowly our eyes adjusted to the dim light coming in slithers of beams from small openings in the corridor. In front of me unfolded the shimmering crystal display. If ever there was a ‘wow’ moment, this was it. In awe our small group were silenced and as one we twirled around, appreciating the grotto entrance. This was just a taster of what was to come, as we ambled carefully through the 60 ft long corridor to the main chamber. I stopped and gasped. My heart leapt with joy at the extraordinary vision surrounding me. A cavern of stalactites glittered from the roof of the cavern, water flowed gently to a pool and water dripped gently down the walls. Light filled the chamber, with beams of sunlight coming through the wall openings as well as light reflected from the serpentine lake. The largest opening was built to allow the light from the setting sun to shine into the chamber. The magical aura was all pervasive. 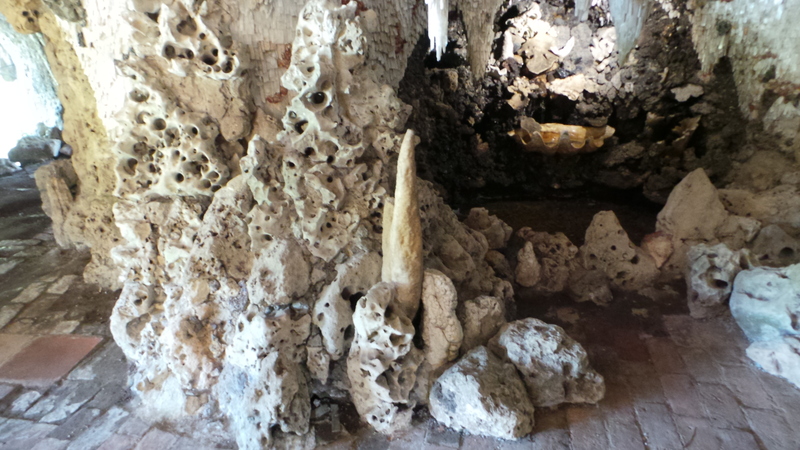 The stalactites are giant inverted wooden cones placed onto the main wooden superstructure which is the main chamber. The interior was covered in lime plaster, a task that alone took four months. 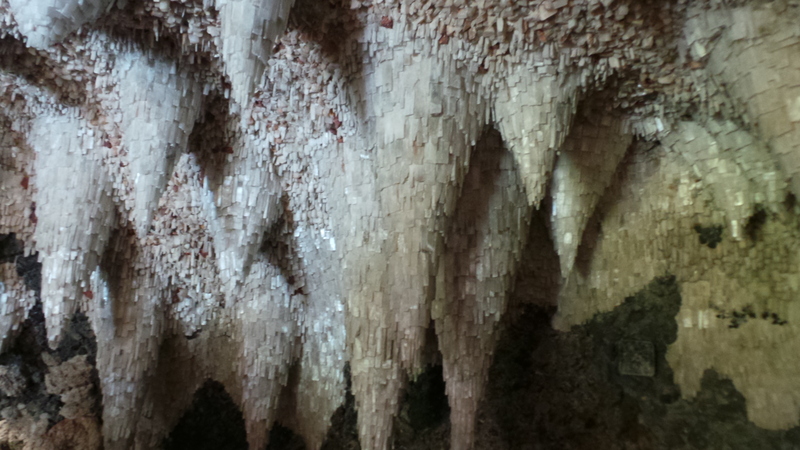 Hundreds of thousands of crystals were subsequently glued onto the coned stalactites and surrounding walls. The crystals were made from calcite, gypsum, quartz and fluorite and the restorers were lucky enough to be able to use some of the original crystals. Most had to be hand-cut however, this task taking over 9,000 man hours as well as eight months to glue into place. The vision for the completed restored grotto relied heavily on a 1776 painting of the grotto by Swedish artist and garden designer (Frederik Magnus Piper) to the King Gustav III of Sweden. Alas google searches of the painting fell foul of European Data Protection laws. The grotto is a peaceful haven with the sound of the rippling water an aural delight allowing meditative thoughts to flow. ‘The acoustics were amazing,’ my friends said, as if reading my thoughts. They had attended a violin concert in the grotto chamber last Christmas and couldn’t believe the magical quality of sound. Visually alluring was the pool of water into which the water flowed. If relatively calm it became ‘nature’s mirror’ and staring into its shallow depths I was overwhelmed with a deep sense of infinity. In silent harmony we headed one by one to the dazzling blinding light outside, the peace and quiet remaining within us for a long time after our visit. Thank you to my friends, I thoroughly enjoyed our day ‘in the park’! Whilst reading My Sister’s Sister by Tracy Buchanan I was taken with her wondrous descriptions of the submerged forests her characters visit and not knowing anything about them I wanted to learn more. Join me as I travel (virtually of course, it’s free!) to seven of the submerged forests around the globe. The forests are created either as a result of deliberate flooding by man whilst building dams or caused by natural catastrophes, such as earthquakes resulting in landslides. 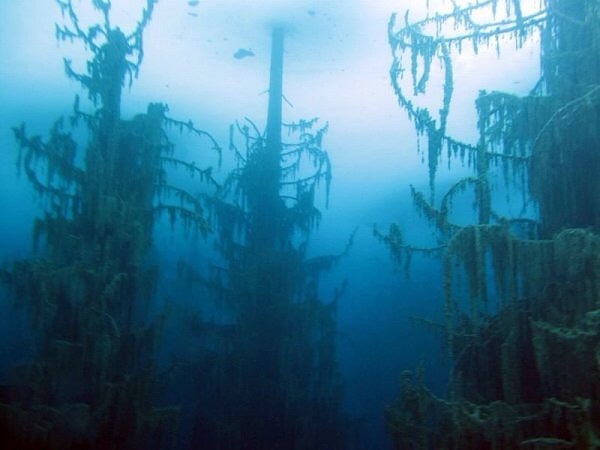 More rarely there are the submerged forests that appear and then disappear according to the seasons. I have written about all three variations in this post. 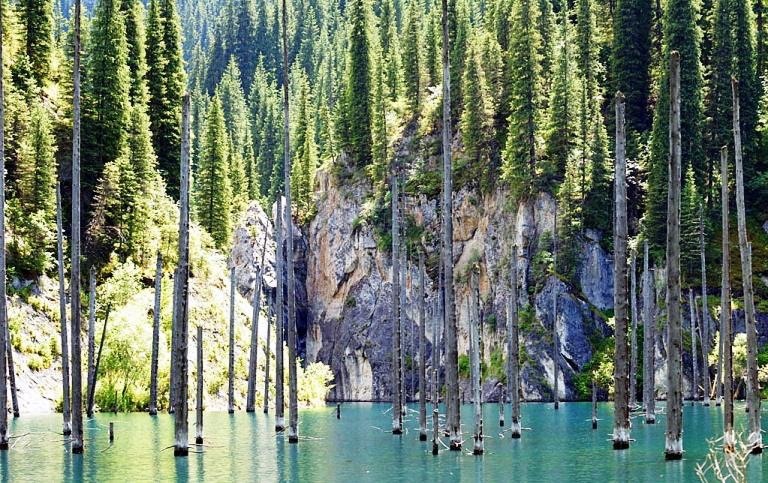 This ethereal submerged forest is a natural phenomena formed every Spring as snow melts from the surrounding mountains. The name comes from the emerald-green of the water which raises by 10 m and floods the forest. 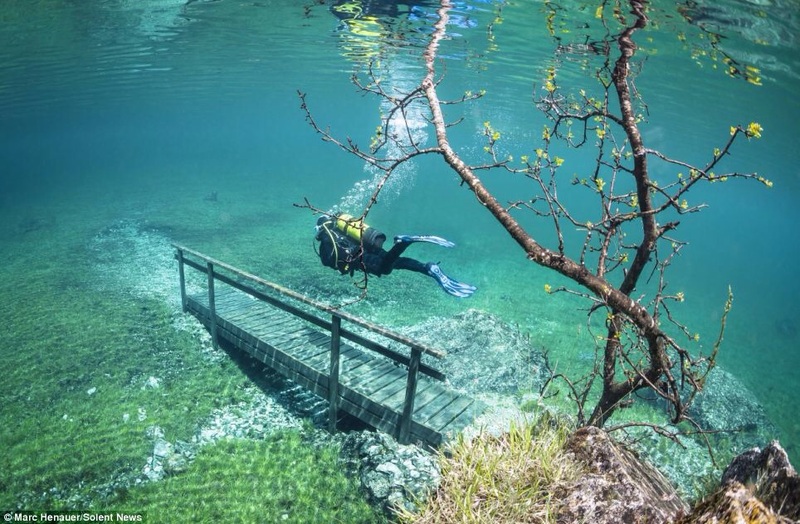 Beneath in the crystal clear cold waters divers flock to witness the mysterious underwater trees, park benches, footbridges and footpaths. The park itself begins to be restored in July as the waters recede. 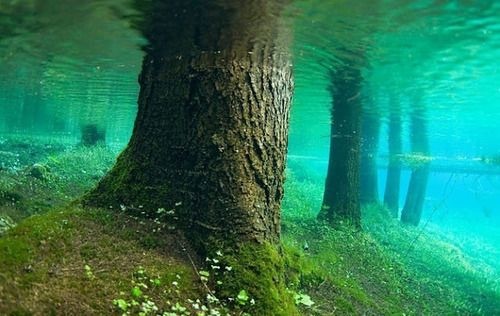 This ghostly haunting submerged forest contains huge spruce trees which still retain their pines in the cold water. The imposing trunks rise like supernatural apparitions out of the water, as if still grasping for life. This 400 m long lake was created following an earthquake in 1911 when a landslide formed a natural dam which filled with rainwater in the valley. Again because of the excellent visibility this lake has become highly popular with divers and unlike Green Lake there are no seasonal restrictions. This lake is the opposite of the two previous ones which showed so much life. Here huge trunks of dead hardwood trees stick straight out of the water in an eerie atmosphere of decay and destruction. It was formed when the Akosombo Dam was built in the 1960s creating the world’s largest reservoir. Altogether 3,000 square miles was flooded. 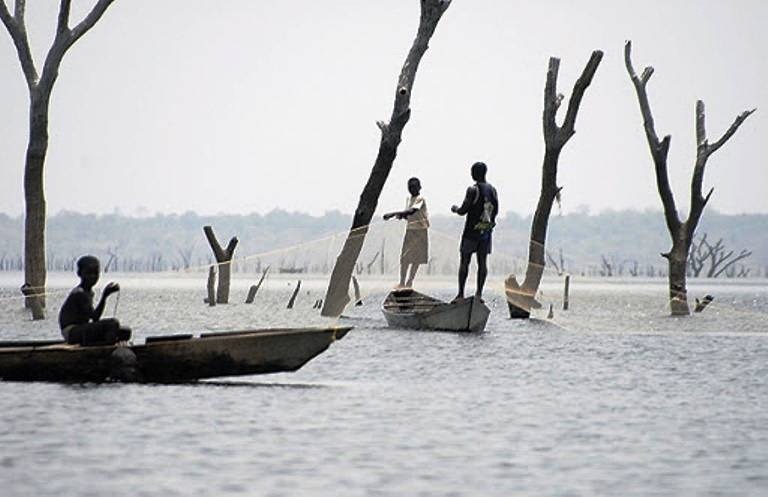 Following the building of the dam hundreds of people have been killed in collisions with the tree stumps in the water as the lake is a busy waterway for fishermen and travellers. Recently it has become part of a massive commercial operation as underwater logging has begun and it is estimated that the total value of the tropical hardwood recovered can be in excess of $ 3 million. 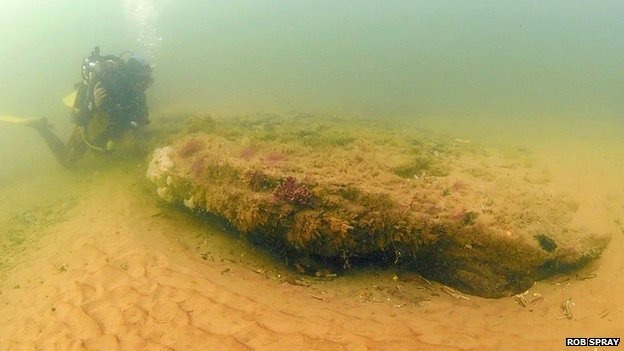 Closer to home there is the submerged ancient forest off the coast of Norfolk. 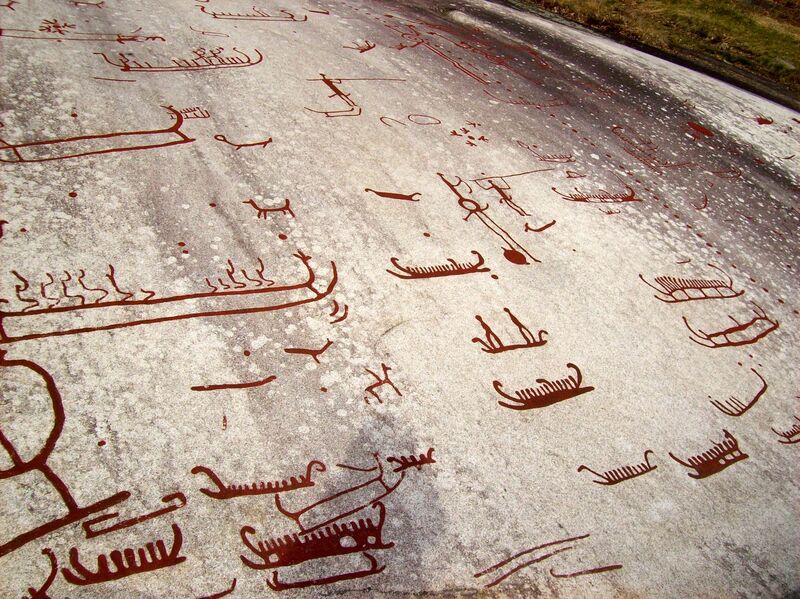 The age of the forest is estimated to be over 10,000 years old and it had been part of the Doggerland region which at one time allowed hunter-gatherers to travel across the land mass to Germany. The lost forest was only uncovered following the storm of December 2013 when tens of thousands of tons of sand and gravel from the buried forest shifted under the power of the waves. Although in more obscured sea conditions this is still a significant find. It is believed that the oak forest was knocked flat by glaciers and the compressed ginormous solid lumps of wood are visible. 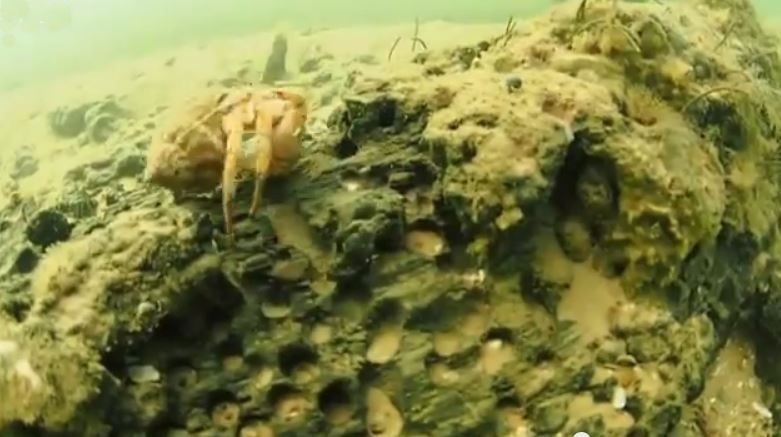 Divers are not only treated to the visual delights of the re-emergence of this ancient forest but also to the array of sea-life, such as star-fish and crabs, that have made a home for themselves in the knotholes of the trees. 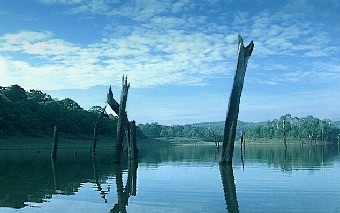 Enclosed within the Periyar National Park this lake was created in 1895 upon the building of the Mullaperiyar Dam. 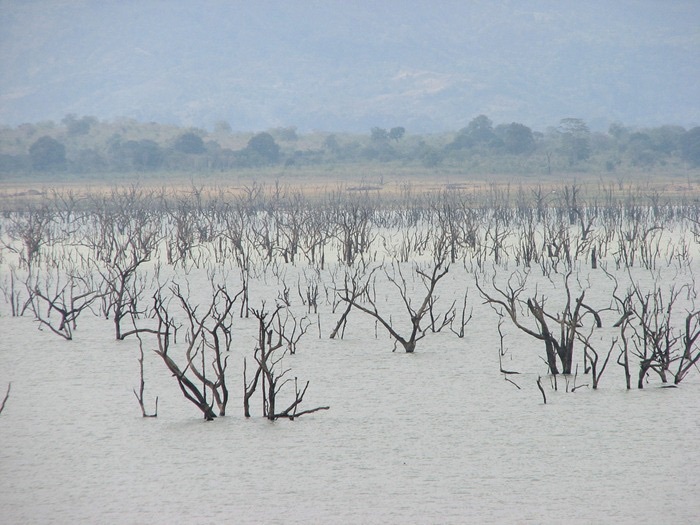 The alluring apocalyptic scene consists of lake punctuated with a graveyard of dead tree stumps situated in the midst of the stunning beauty of hills. The park itself boasts a large variety birds and mammals as well as being a famous tiger and elephant reserve. Situated in Transylvania this haunting (and perhaps haunted?) 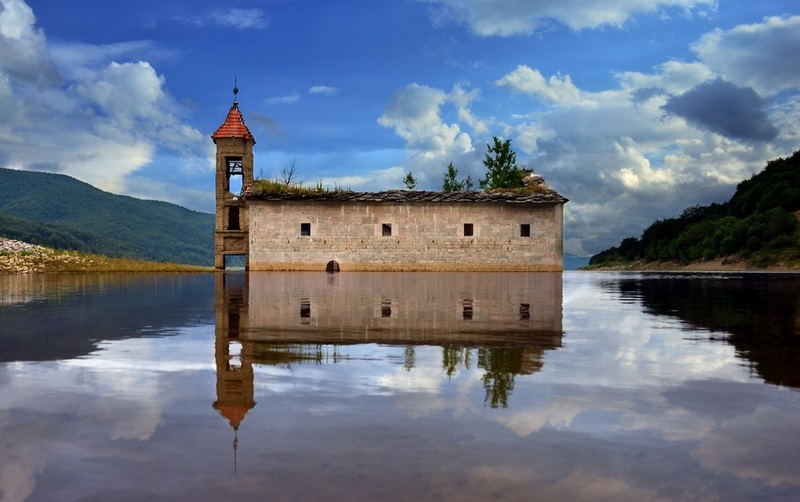 lake was formed during the building the of the dam which resulted in the flooding of an entire village. 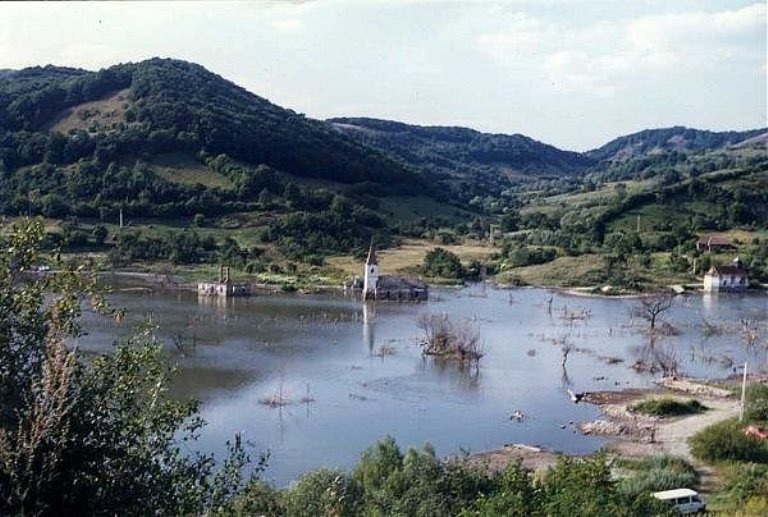 The villagers were displaced in 1977 to make way for the dam. Eerily the former Roman Catholic Church tower dominates the centre of the lake. The dichotomy of the normal in such an abnormal situation lends the area an aura of otherworldliness. The church itself was visible until its recent collapse. Dead tree stumps are dotted around the lake. 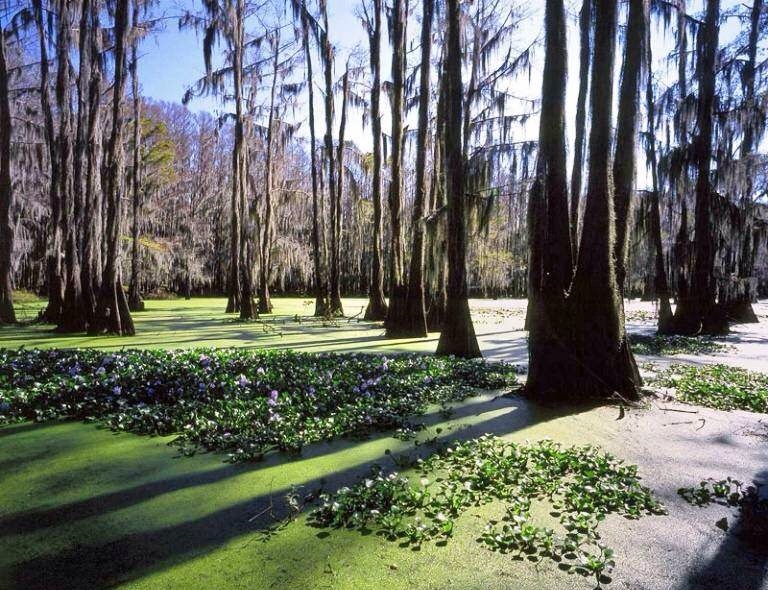 It was a delight to read about Lake Caddo on the Texas-Louisiana border. 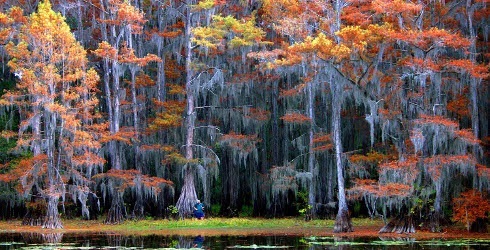 It is the world’s largest cypress forest and is home to living trees that are growing in their semi-submerged state. The sense of magic and mystic is palpable from the photos alone. The lake is named after the Native Americans – Caddons or Caddo – who lived on the land until expelled during the 19th Century. 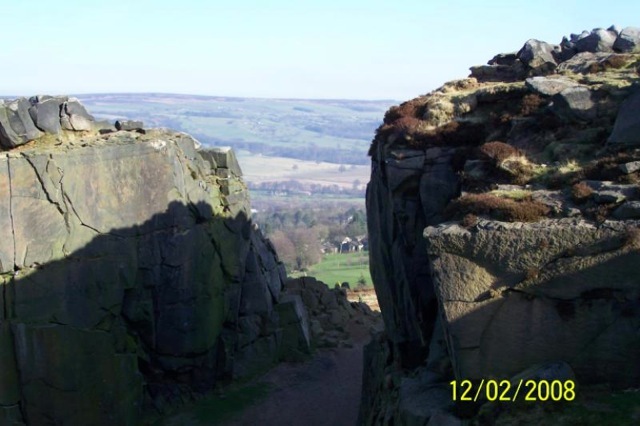 Local legend tells of an earthquake in 1812 leading to the formation of the lake. 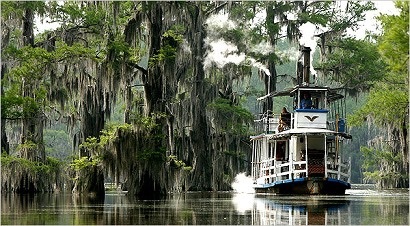 Besides being a place of great natural beauty it is also renowned for the hundreds of sightings of Bigfoot in the area! I hope you have enjoyed the tour of only a few of the world’s submerged forests. Have you visited any of these? Or perhaps even dived in the lakes? It would be interesting to hear from you. All comments are very welcome. I seem to be tied with an elastic band to Yorkshire as it pulls me back year after year. Upon my return from one holiday there my heartstrings are pulled taut and as the tug over the months becomes more forceful and relentless back I ping to the county where I grew up. Following last weeks holiday in the midst of the Yorkshire Dales, the elastic band is tighter than ever with my heart unwilling to return just yet…my body alas has already come home. With an early rise on the day we travelled we successfully managed to avoid the worst of the half-term and Bank Holiday traffic (a national nightmare of school holidays!). 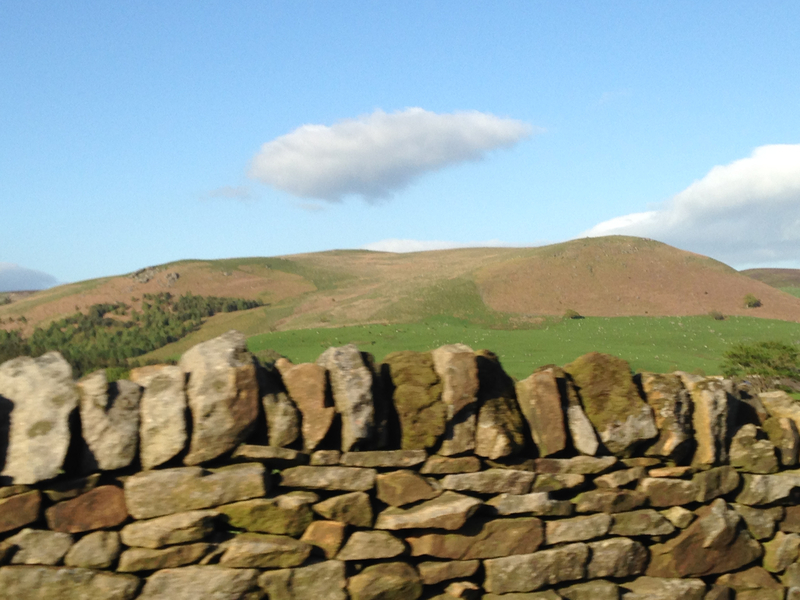 As the A1 gloriously rolled its way northwards across the moors my heart fluttered and unconcealed joy shone on my face. A grin that was to last the week took a firm hold. For us all it was as if our souls gave a collective sigh when the locks to the weights of work and school clicked open and lighter, happier we drove to our cottage. I knew it was remote; just not how remote. Leaving the giant golf-balls of Menwith Hill – one of world’s largest monitoring stations – far behind us we headed North. 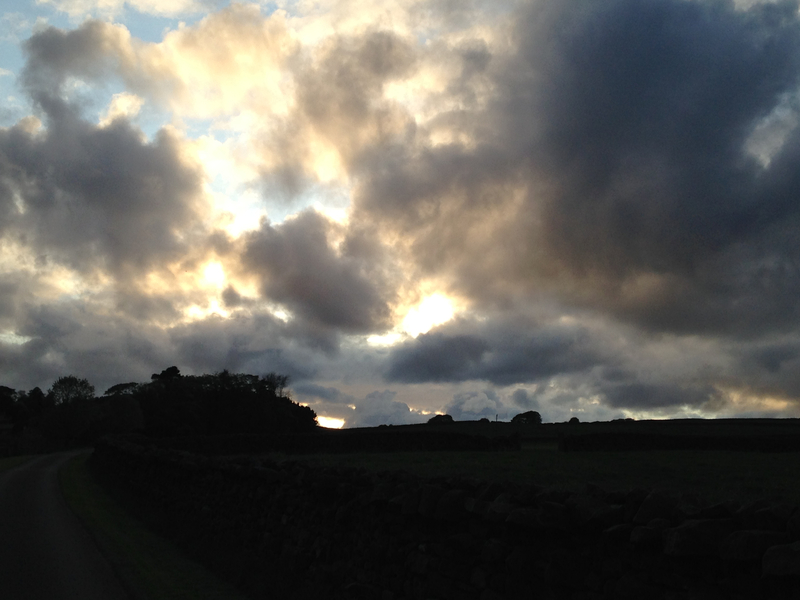 Now on top of the moors, a slight yelp of panic as familiar civilisation was replaced by complete isolation. No other cars, no mobile reception, just the odd couple of houses here and there grandly sign-posted as a far-flung village. From the main road we turned into a lane, then a smaller lane and finally a gravel track before travelling up a long drive-way taking us up to the cottage. In reverence we stepped out of the car. The vibrant silence struck me first. Total and absolute. In awe I slowly spun around; we were surrounded by the moors with the cottage and the owner’s house nestled in the valley. Then the sounds of nature penetrated my car-weary mind and the baas of the sheep, the tweets from the birds, the rustle of the gentle wind lulled my noisy brain. The tingle of the fresh air glistened upon my skin. Soon in a peaceful solace my husband and I sat outside enjoying the glorious views whilst delighting in the unique combination of home-made fruit cake, local Wensleydale cheese and home-made onion and ginger chutney. All courtesy of the welcome hamper – the most generous I have ever received and despite our best efforts we only managed to make a dent in all its contents during the next few days. That first night was the most restful and refreshing I have experienced for a long time. If I woke the odd call from the sheep soothed my mind and contentedly I drifted back to sleep. 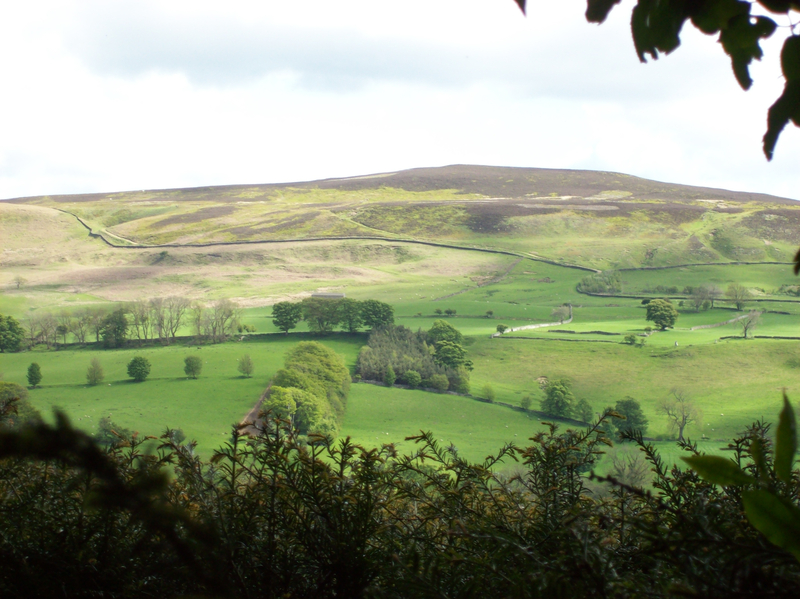 The next morning I opened the curtains and in awe gazed at the surrounding nature – until my hungry chaps (husband and teenage son) started muttering about breakfast… Day after day my eyes feasted on the moors. 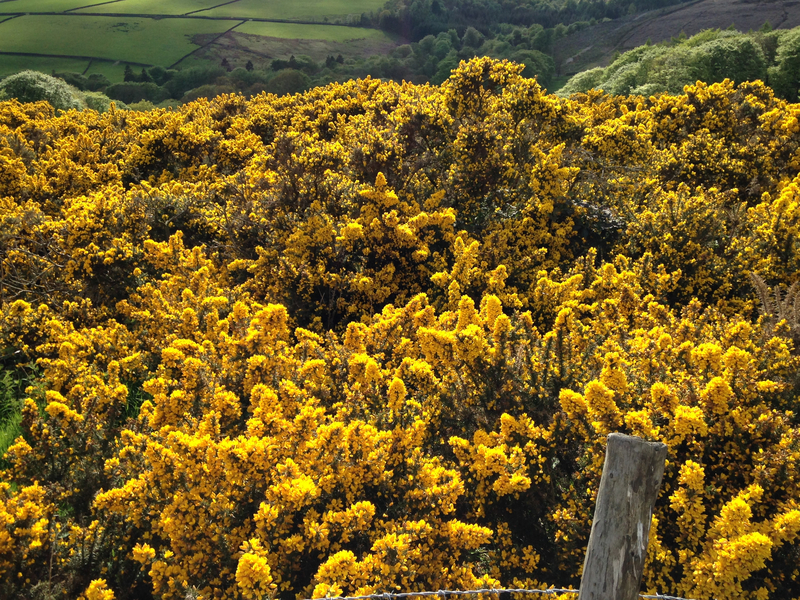 One day as we took a a two hour drive across the central North Yorkshire moors en route to a tourist destination we encountered treacherous narrow lanes, soul-defying hills, steep road edges. Such amazing stunning scenery. Truly life-enhancing and again and again we stopped for photographs. Three hundred or so photographs later I am still busy sorting. The beauty was not lost by the odd light shower and through the dismal drizzle we were rewarded as the sunlight pierced the grey/black clouds and radiant sheer light fell upon a patch of moor, beaming its purple hues across the landscape, lighting up the green brilliance of the fields below where sheep were scattered and across the valley hung a ghostly misty haze. Slowly my heart is returning home, the elastic binding me to the moors is easing gradually and soon body and soul will be rejoined. Then during the year I know the grip will become more fierce, the wrench ever stronger and nothing can keep me from the visual and spiritual wonder of the moors. From ‘Keeping Quiet’ by Pablo Neruda. 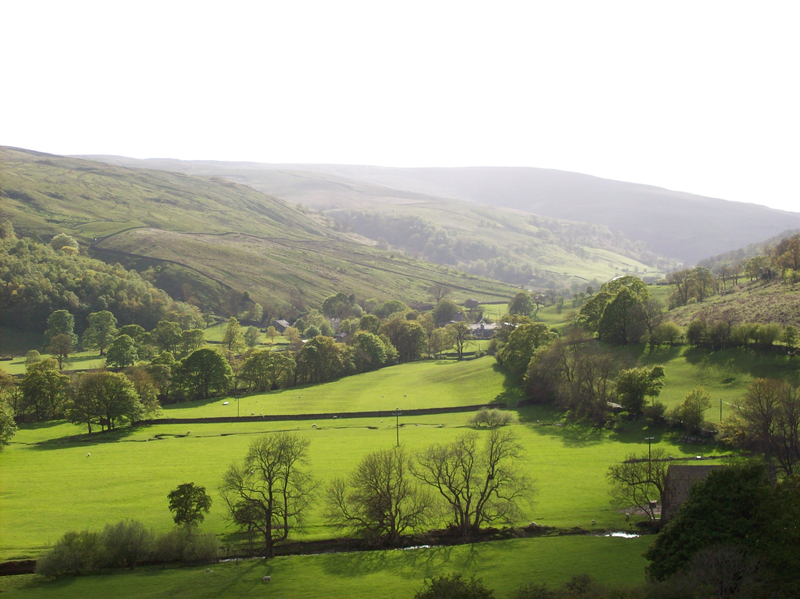 I’m off on a weeks holiday tomorrow to the beautiful North Yorkshire Moors. With all that mesmerising scenery the wi-fi just does not want to work, so I’ll be awol from here for the time. 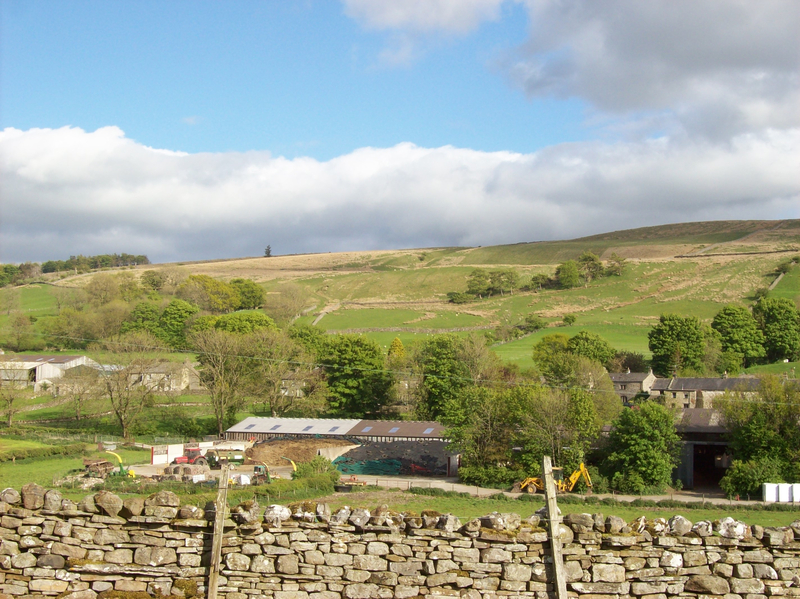 I came to Yorkshire as a young child and lived there for many years. 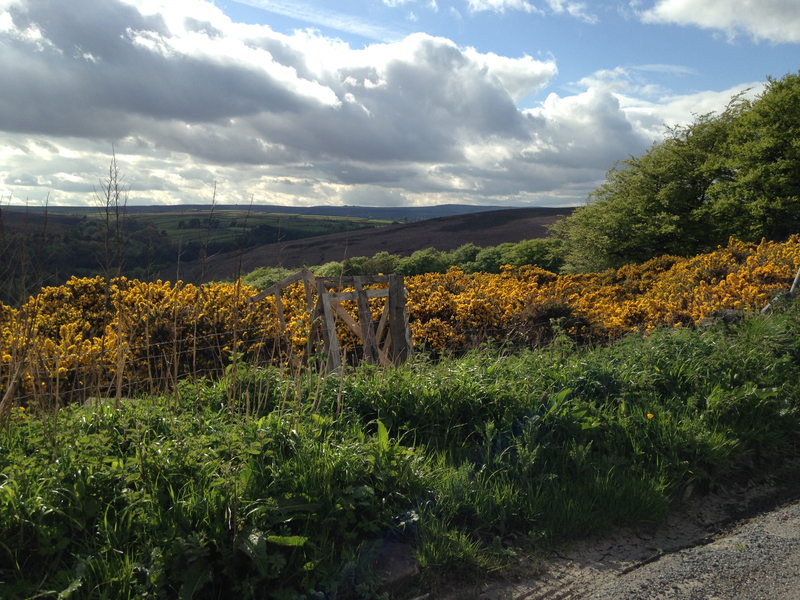 I never tired of the beauty of the moors and many times a week we would all go for long walks across them. There is nothing quite like it! To ensure you all get a feel for the moors I’ve included the lyrics below. They are from a famous folk song called ‘The Manchester Rambler’ and was written by Ewan MacColl. Here are part of the lyrics. Ewan MacColl wrote this song as he was part a group of trespassers across the moors fighting for more free access on the moorland and mountains across the UK. 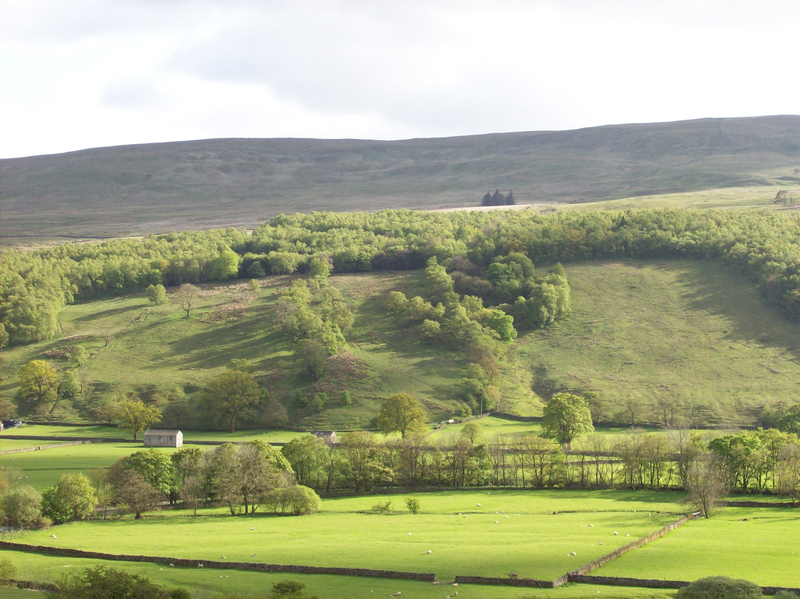 The protest succeeded and led to, amongst other things, the development of the national parks and long-distance footpaths – the first being the Pennine Way opened in 1965. 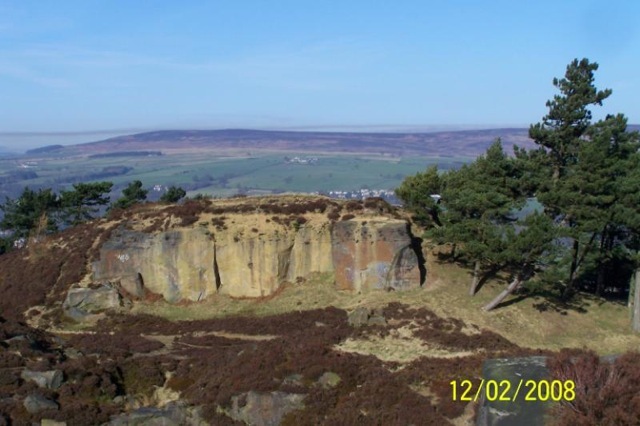 You can listen to the song and delight in views of the moors on the following link.